In contrast to the spectacle of Le Tour (for better or worse), there's still nothing like the look on a kids's face when he or she gets a new bike. 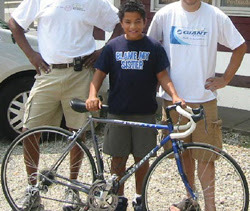 We got to see this yesterday when we donated a used bike to one of our favorite riders, Malcolm from Alliance, Ohio. Malcolm and his family are regulars on our Night Rides on the Towpath, and he is always riding with the fast group up front. This new bike will help him push the pace on us even more! The bike is a Giant Kronos, which had belonged to Sharon, our bookkeeper. We gave it a full tune-up, new tires, new handlebar tape, and a brand new CatEye cyclocomputer. Malcolm and his father went out for a ride to test it out immediately. When they got back, he couldn't wait to show us his top speed on the computer! What a nice gesture! Malcolm absolutely smoked me the other night on his old rig. I'm afraid to see how fast he is now... congrats on the new ride, Malcolm!